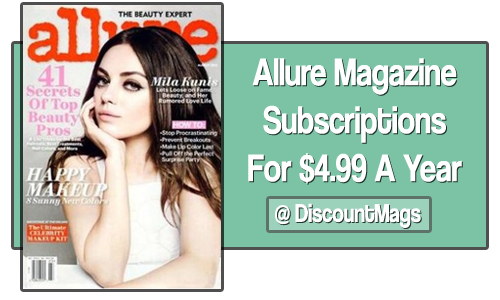 Allure Magazine subscriptions are on sale for $4.99 a year. Order up to 3 years at this price. Use the code SOUTHERNSAVE to get this deal. Allure is your personal beauty expert delivered to your door every month. A subscription will keep you up to date on new trends, products, and even ways to fit these into your budget! Enjoy articles on everything you can imagine for 41¢ an issue! This offer expires at 4/14 at midnight.